After almost nine months the redesign of MinnesotaSeasons.com was finally completed on October 10, 2014. All species and destination pages are now tabbed, reducing page length and allowing the visitor to focus on their interest. Thumbnail images have been replaced with much larger preview images. Full size photos are now presented in a light box, not on a separate page. A new Video tab has been added to every species and destination page. The embedded videos are from YouTube, from other sources, and from visitors to MinnesotaSeasons.com (you). A slide show has been added to every destination page. All species pages now include IUCN Conservation status and NatureServe Conservation status. All plant pages also include wetland indicator status, if assigned; and weed status, if appropriate. All species and destination pages include links to allow visitors (you) to upload photos, videos, species sightings, and observations. This entry was posted in Website and tagged MinnesotaSeasons.com, redesign on October 10, 2014 by John Valo. Many of the Destination pages at MinnesotaSeasons.com now include one or more videos. So far, there are 96 videos of 66 destinations. Most of those were shot at state parks. While a few were professionally made, most were created by visitors. 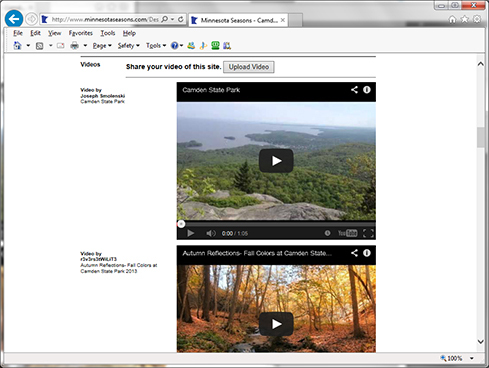 Have you made a video of a trip to a park or other natural area in Minnesota? Share it with others on MinnesotaSeasons.com. Simply click on the Upload Video or the Upload Photo or Video button on any destination page, then attach the video, or a link to the video, to the e-mail form that pops up. This entry was posted in Website on February 12, 2014 by John Valo. MinnesotaSeasons.com distribution maps for plants have been updated to include location data from Early Detection and Distribution Mapping System (EDDMapS). EDDMapS lists 394 species in Minnesota. Not all the listed plants are a problem in Minnesota, but all of them are exotic to the U.S. and are listed as a problem somewhere in the U.S. Distribution maps for listed plants that appear on MinnesotaSeasons,com now include EDDSMapS observations. This entry was posted in Website on February 6, 2014 by John Valo. 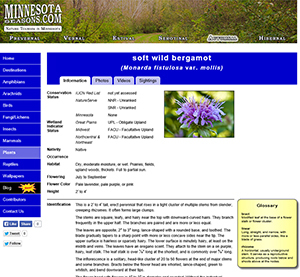 In May 2013 the Minnesota DNR updated MNTaxa: The State of Minnesota Vascular Plant Checklist. It is now available on the DNR Website. It contains a statewide distribution by county map for each species listed. For the past four weeks I have been updating all plant distribution maps to include the MNTaxa data as well as data from the Bell Museum of Natural History Herbarium, Flora of Minnesota, Specimen Database. The project was completed today. All 786 plant distribution maps have been updated. This entry was posted in Website on February 1, 2014 by John Valo.